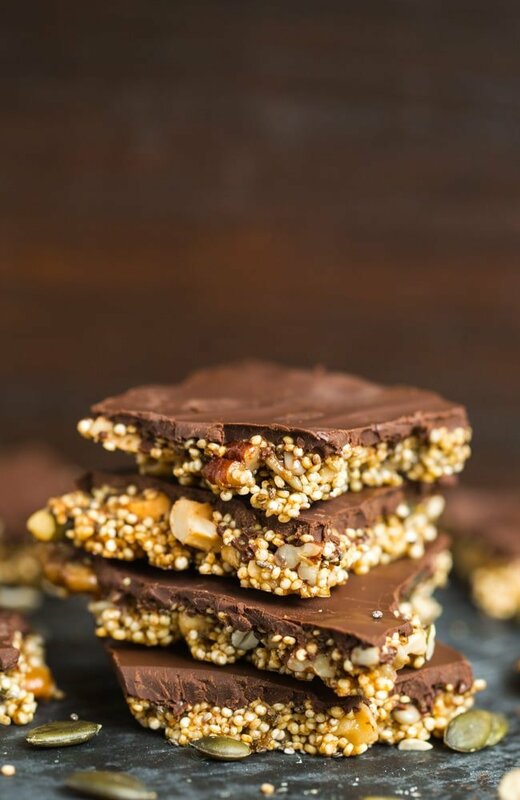 We’re talking next level quinoa brittle here – covered in chocolate for good measure. 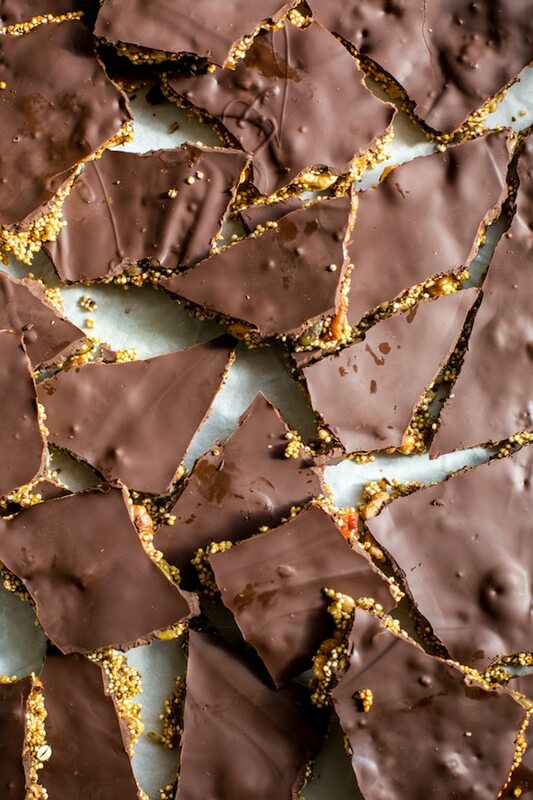 Altogether this brittle is pretty easy to make. The prep can be done in about 10 minutes with minimal work – it mostly just comes down to mixing it all together and waiting for the brittle to cook and the chocolate to harden. Mix everything together and then spread it out on a large baking sheet lined with parchment paper. Bake at 350 for about about 30 minutes until golden and caramelised. While the brittle bakes melt your chocolate. Place the chocolate in a heat proof bowl that’s large enough to sit over the top of a sauce pan. Add an inch of water to the sauce pan and bring to a simmer. Once the water is simmering place the bowl of chocolate over the top of the bowl, make sure that the water doesn’t touch the bottom. Stir the chocolate as it melts. When there are only a few chunks of chocolate left remove the bowl from the heat. The residual heat will be enough to melt the rest. Set the bowl aside to let the chocolate cool. Personally I find it easier to just melt it in the microwave. Pop a heat safe bowl in the microwave and melt at 30 second intervals stirring in-between so the chocolate doesn’t start burning. Once your brittle has cooked and your chocolate has melted all you need to do is pour the chocolate over the top let it harden. 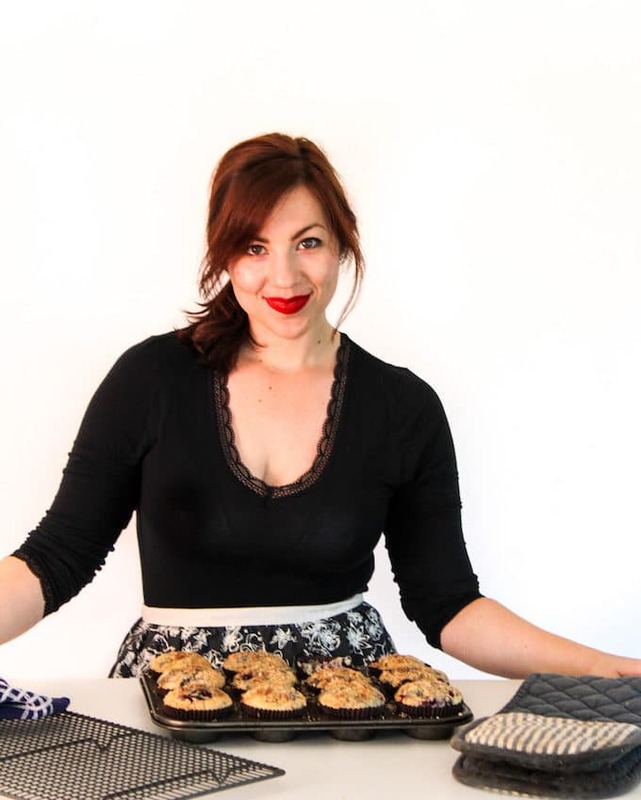 Pop your baking pan in the fridge or freezer and then break into chunks when you’re ready. While this is definitely something you can snack on year round, this quinoa brittle would make for a great homemade, holiday gift. 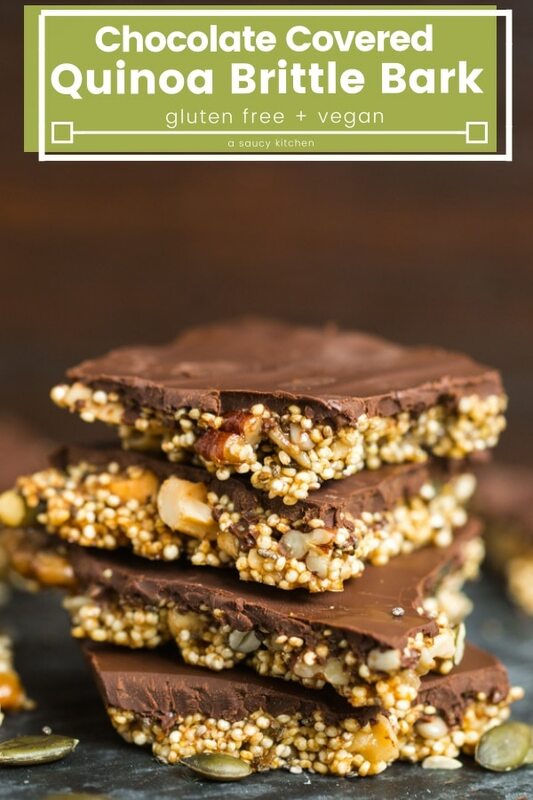 Feel free to play around with the types of nuts and seeds you use to make this. Add peanuts, almonds, sesame seeds – whatever you like! Just try to keep the amounts of things the same and that shouldn’t be much problem at all. 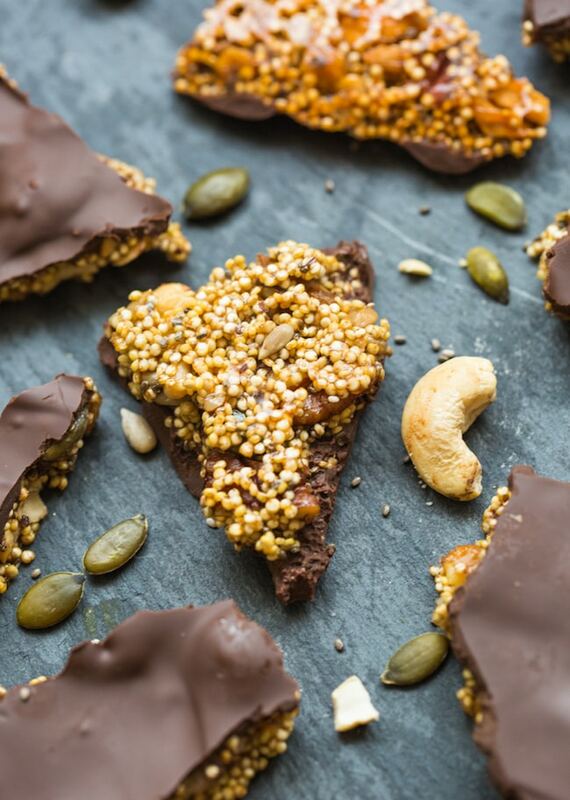 Don’t forget to #asaucykitchen on instagram if you this Chocolate Covered Quinoa Brittle! I love seeing what you make! You can also post your pictures to my facebook page! Preheat oven to 350°F/176°C. Line a large a baking sheet with parchment paper and set aside. Mix the maple syrup, coconut oil, vanilla extract and salt together in a large mixing bowl. Stir in the quinoa, nuts and seeds. Mix well until fully combined coating the dry ingredients in the wet. 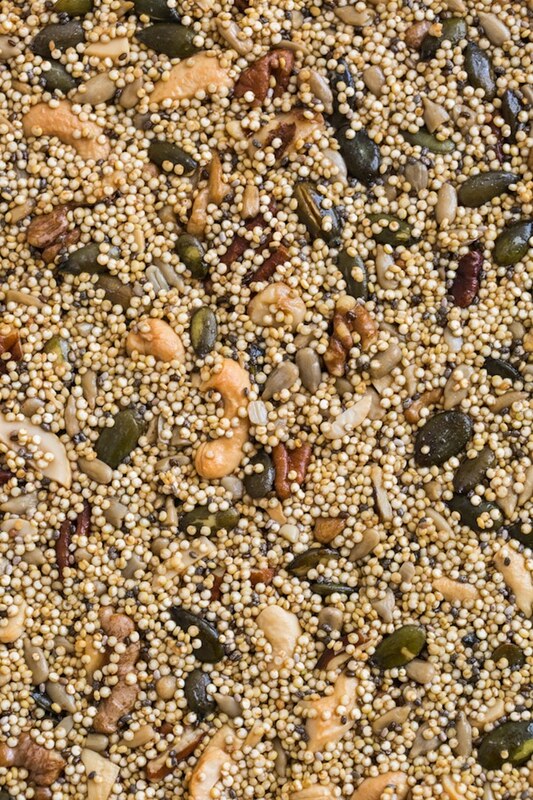 Spread the quinoa mixture evenly in a thin layer across the lined baking sheet. Place in the middle of the oven and bake for 25-30 minutes. The edges will begin to caramelise and look golden. While the brittle is baking melt your chocolate. Place the chocolate in a microwave safe bowl. Melt in 30 second increments whisking after each segment until the chocolate is completely melted and smooth. Once melted set aside. 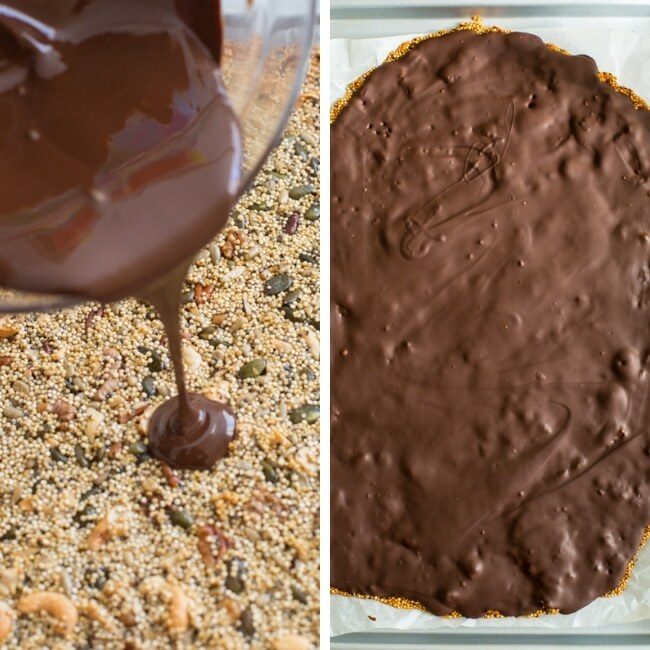 Pour the chocolate over the top of the brittle in an even layer. When the baking pan has cooled place in the fridge for 30 minutes until the chocolate hardens. Once harden break into chunks and enjoy. Make sure to spread the brittle mixture out in a thin layer before baking. It's too thick it will be more chewy and less crunchy. This can be kept stored in the freezer for up to a month. Do you rinse the quinoa first? Hi Katie! I never really bother rinsing my quinoa anymore – most the time it either comes pre rinsed and I’m also not sure I’ve ever noticed a difference. If the package instructions recommend it for your quinoa then I’d go ahead and give it a quick rinse otherwise I don’t think it’s needed. Looks delicious! What could I sub for the coconut oil? Thanks! Thanks! You could use butter if coconut oil isn’t an option!